On 15th October 2009 Tempo Semanal sources within the Government of Timor-Leste revealed that on 12 October 2009 4 TNI officers and 4 paramilitary personnel in addition to one civilian entered the Cruz area of the southern most Passabe sub-District in the isolated Democratic Republic of Timor-Leste enclave Oekusi. When the central government of Timor-Leste only heard about the problem 3 days after it had happened it held an emergency meeting on 15 October 2009. The acting Prime Minister (Vice Prime Minister Jose "Lugu" Guterres, Acting Secretary of State for Security (Secretary of State for Defence, Julio Tomas Pinto), Secretary of State for the Special Region of Oekusi, Jorge Teme, and the Secretary of State for the Council of Minister, Agio Pereira participated in the crisis meeting. The 4 TNI were carrying M`16 semi-automatic assault rifles and the paramilitaries were unarmed, and the civilian (suspected to be former 1999 era pro-autonomy Sakunar Militia). They were carrying the Indonesian Mera Putih (Red and White) national flag. They assaulted a group of Timorese citizens working on a project to build a border police post in the area known as Cruz next to the mountain known as Nuaf Bijae Sunan. The leader of the TNI officers insulted Mr. Agustino Eta the Chefe Aldiea Haumnani along with the 7 Timorese labourers working on the police post. The TNI forced an end to their labour, and then forcibly took the labourers tent. The TNI then stole 50 sheets roofing tin intended for the police post, taking them to the TNI post across the border. Mr. Eta told Tempo Semanal that the TNI officers asked him "who instructed him to build the border police post, and to whom did you get permission from to build this police post? ", The TNI officer told Mr Eta that the area is in dispute between Indonesia and Timor-Leste. Mr. Eta responded "Our Timor-Leste leaders told us to build this border police post here". He added "that Timorese do not need to ask permission to build a police post on their own territory". Furthermore, Mr Eta angrily continued that "if we want to build post in Indonesian then we need to ask permission". "For me and my Suco Abani community we don't think this is a disputed area, but it is our land [Timor-Leste]". 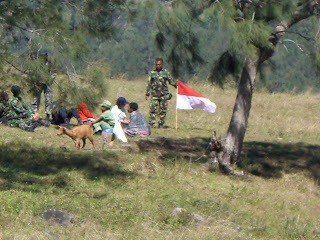 Armed TNI and Timorese "socialise" in the disputed area. TNI plant the Merah Putih. After listening to this answer the TNI and their paramilitary HANSIP personnel got angry and started to strip the post of its material, taking it to the nearby TNI post on the Indonesian side of the border. When speaking with Tempo Semanal on 12 October soon after the incident Mr. Eta said that "Indonesians are making gardens in this area, and so Timor-Leste border police post is necessary to maintain security". After stripping the post of all of its critical building materials, property of the Government of Timor-Leste the Indonesian security forces returned to the Indonesian side of the border. These actions in Passabe are part of a wider set of old and current border problems with Indonesia, set against the background of the recent arrest of ex-militia commander Maternus Bere in Cova Lima District in August 2009. Since June 2009 Oekusi's western border near Naktuka has been the scent of border disputes with a number of armed TNI being arrested by Timorese border police for entering Timor-Leste, and quickly being released to return to Indonesia as Timor-Leste Government is sensitive to percevied threats from the country's neighbour of some 230 million people, and former occupying power. Passabe was the scene of some of the world killing during the post referendum violence in 1999 with the Tumin, Passabe massacre seeing some 120 youth and men being macheted to death in one massacre by Sakunar militia, supported by the Indonesian TNI. Justice has never been served on the perpretrators, who reportedly live just 3km across the border a decade later. Located at the south western tip of the Oekusi Enclave this area (between Oelnasi in Timor Leste and Manusasi in West Timor) has been the source of local conflict since the 1960s. The conflict has traditionally been over garden areas. In 1965 a local conflict ended up with Portuguese police killing at least one West Timorese. This problem flared up again in 1972 and again in 1983. The 1983 conflict lasted two months and resulted in many injuries from stone throwing. Apparently, Mario Carrascalao and Indonesia's Minister for Home Affairs Rudini were involved in solving the dispute then. 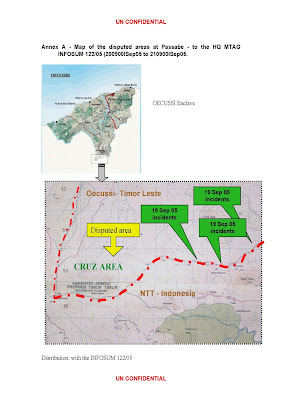 As a result of TNI's complaints about the location of the TCL this area was divided by the TNI and UNPKF in 2002 into three patrol areas 1) for the TNI (inside the TL border) 2)UNMO and 3) the BPU. In actual fact the TNI took advantage of a rotation between the JORBATT and ROKBATT elements of UNPKF. In effect UNPKF ceded East Timorese territory to Indonesia – albeit in what was hoped to be a temporary manner. A day or two after this meeting former President (Now PM) Gusmao attended a meeting in the disputed border area beneath Nuaf Bijae Sunan. The Indonesian delegation was comprised of six Indonesian Parliamentarians who had been guests of the Timor-Leste Parliament the previous week, Chiefs of Police from Kupang and Kefamenanu, and the TNI local commander from Kefamenanu. President Gusmão's party included Vice-President of the National Parliament (now deceased) Jacob Fernandes, former Minister for the Interior Rogerio Lobato, former Secretary of State for Labour and Solidarity Arsenio Bano, and PNTL Commander Paulo Martins. The meeting produced no tangible results. All 18 of Oekusi's Chefe de Sucos were present for this meeting, the first time that they had met collectively since 1999 and a sign of the importance of the issue that Oekusi's communities attribute to this problem. In June 2004 three individuals were arrested by TNI for allegedly wandering into their patrol area in search of a missing horse. They were repatriated only after lengthy discussions between Indonesian and East Timorese authorities. In July 2004 there was a stone throwing battle between 100-200 people in the area with at least three people being wounded. The conflict is further fueled by the presence of Passabe refugees in Manusasi, and the fact that ex-Sakunar militiamen Andre Ulan (TNI) and Julio da Costa who reside in nearby Nunpo are reportedly in the area. These men are indicted by the UN for Serious Crimes including for the Passabe Massacre. In March 2008 local NGOI BELUN reported in a national conflict analysis that Suco Abani in Post Passabe, Oekusi was one of the most likely to suffer local conflict as a result of border problems being exacerbated by local competition over land and TNI manipulation of these problems.